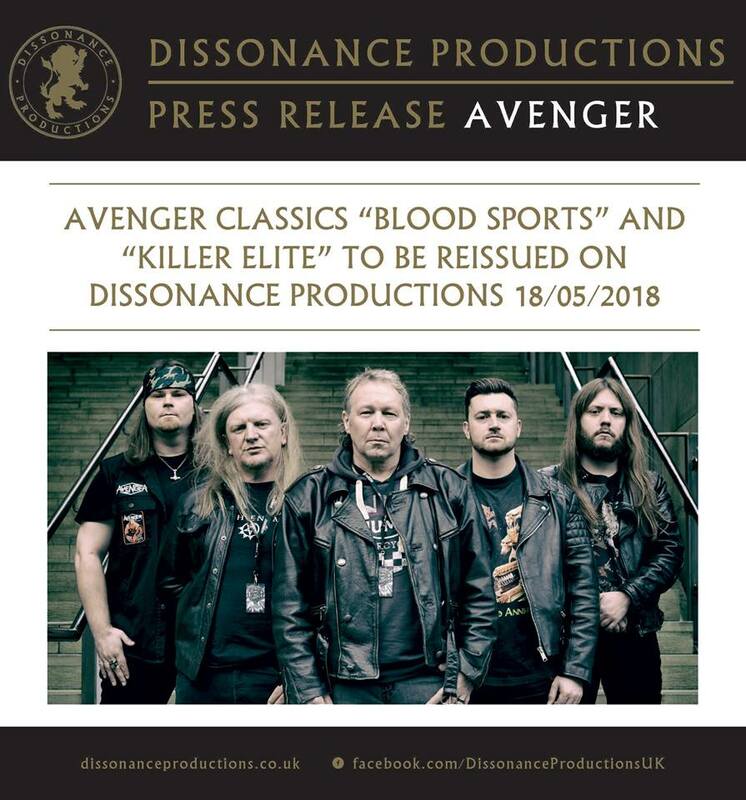 Home » News » AVENGER Classics BLOOD SPORTS & KILLER ELITE To Be Reissued Via Dissonance Productions! AVENGER Classics BLOOD SPORTS & KILLER ELITE To Be Reissued Via Dissonance Productions! Metal, classic metal, thrash metal… NWOBHM! These are the defining genres that best describe AVENGER. Not a random stab at a description, but an archive of metal styles the band have molded themselves to since their NWOBHM founding – by 3 members of cult heroes Blitzkreig – over three decades ago! During this time, AVENGER honed their playing skills and built up a worldwide fan base, enjoying rapturous receptions at festivals and concerts from the Eastern seaboard of America, to the metal hungry fanatics of Europe and down to the tropics of Latin America. From the word go, AVENGER always had one mission statement: get out and put on as intense and as professional show as possible. No wonder AVENGER became one of the most respected British heavy metal bands, and that both of their albums released back in the day – Blood Sports (1984) and Killer Elite (1985) – hold a legendary status today. Thanks to Dissonance Productions and Back On Black Records, both classics will be available on both CD and LP format on May 18, 2018, and it’s safe to say, that these will be considered ‘ultimate editions’. The albums have received dynamic mastering by Bart Gabriel (who recently mastered reissues of bands such as CIRITH UNGOL, SORTILEGE, and the new PAGAN ALTAR and CRYSTAL VIPER albums), both include previously unreleased bonus tracks and include previously unseen photos from band’s archives! Saxon To Release 9 CD Box Set: The Solid Book of Rock!